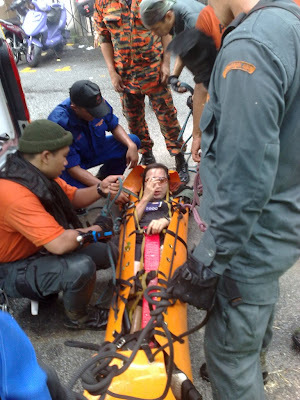 Last Friday evening, I received a call from Gerakan Dang Wangi, informing me of an injured climber at Bukit Tabuh. A group of Civil Defence rescuers were mobilised and dispatched to the scene. Upon reaching the victim, it was suspected that she may had a broken leg. After immobilizing her legs, she was wrapped up in a Sked Stretcher, flexible enough to be rolled up but yet sturdy enough when assembled. 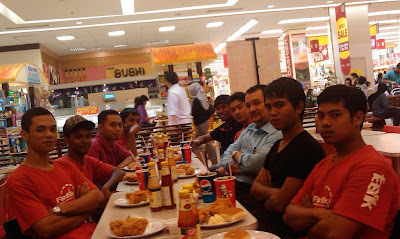 It has been a long time since I had met some of my trainees. These are the trainees under the Train & Place program. Its a 6 months program by the Ministry of Human Resources to eradicate or minimize unemployment by 're-training' retrenched workers or unemployed graduates for better adaptation to a particular industry, in this case the automotive industry. The company I work for was chosen as a training provider for 100 trainees and I was their 'Guru Besar'..haha. Over the past 1 ½ years, my ex-schoolmate from SSP (Sekolah Sri Petaling), had somehow re-connected, much of it thru the power of Face book. Some aged faster, some slower, and some looked as if they were stuck in time as they look as youthful as before. Unfortunately, I fell into the first category. Sigh!!! My good friend, Julian Khan, was the creator of the FB group. Much of the ‘recruitment’ was done by another friend, Derek Ho, about 88% of the total recruited. This feat may not sound extra ordinary if not for a fact he resides in Canada! How this guy managed to do that from there defeats my mind and tells a lot about the guy.